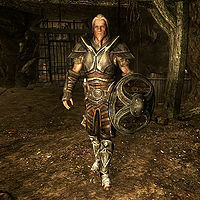 Silver-Blood Guards are mercenaries hired by the Silver-Bloods as guards in Cidhna Mine. If you approach them they may mention the following: "You mess with the Silver-Blood family, you end up here. ", "Now this is real guard duty. Just throw them in the mine and be done with it." or "I catch you stealing anything, I'll break your neck." They wear a set of steel armor without a helmet, and carry a steel shield, a steel mace, a steel dagger, a hunting bow and a dozen steel arrows. They also have a torch and the key to Cidhna Mine. This page was last modified on 24 December 2013, at 21:34.